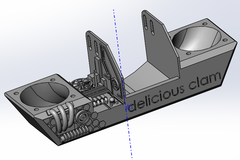 Master piece of Delicious and Clam King ！ Say goodbye to curling edges and ugly overhangs！ Up to 80 degrees overhang without any support structure! BUT EVERYTHING HAS ITS COSTS. Some sacrifices must be made. The printing length of x axis will be 25-35mm shorter. Use the slider extender attached. Recommend to print first one with few support, and use this fan duct to print another without support. Don't ask me to do some modifications to shrink the width of fan duct ! “if you always make things people ask for and don't have any courage to lead the customers, your products will be neither fish nor fowl" A wise respectable old buddy scolded.